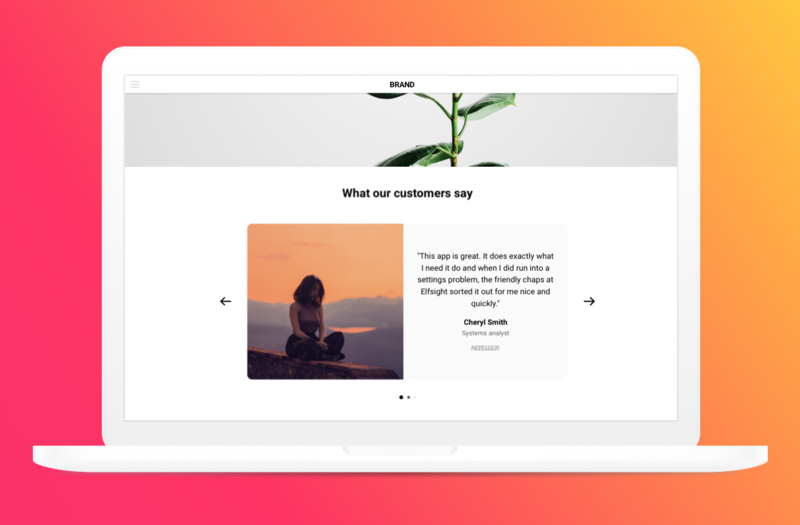 How to add Testimonials to WordPress? Upload setup zip to your website. NOTE! At this stage, make sure you upload not the whole item zip, but only WordPress installable zip. Activate the plugin. Go to plugin settings page through main menu. Build a new widget then customize it using Live Widget Editor. Copy and paste the shortcode of the widget to the preferred page of your website. That’s it! Now everything is up and running! Don’t know how to add testimonials to WordPress website? Would like the plugin installation to be done by a professional? Feel free to address Envato Studio to get high-quality help installing your plugin. Then simply open a ticket in our Support Center at https://elfsight.ticksy.com/ and we will be back with professional help quickly. Expect a response Mon – Fri from 10am to 7pm CET. Our team is open to our customers and aim at getting better! We are a tight and trusted team of full-time developers having 10-year experience. Sharing the same goals and putting our best knowledge into what we do make us successful. One of our priorities is to bring the feeling of satisfaction with our items to the clients! So you can always rely on us! 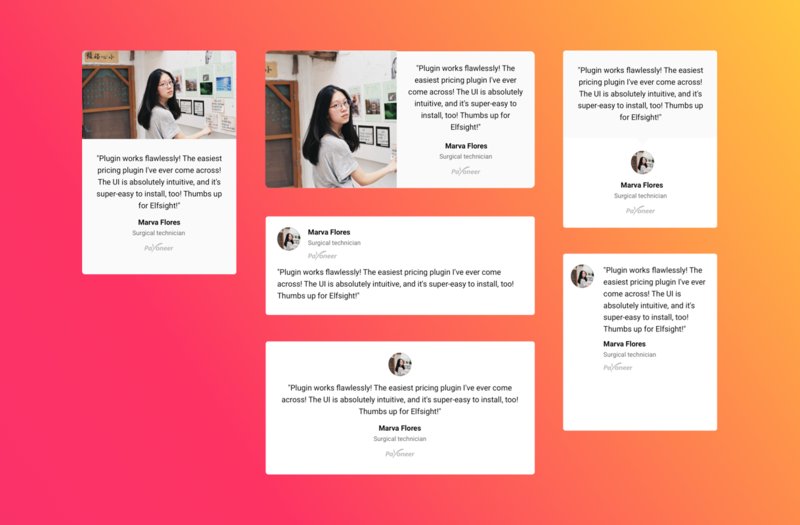 WordPress Testimonial widget doesn’t work correctly on your website? Report your issue or bug by describing it in details and send us a link to your website. We’ll do our best to find a solution. We introduce new updates and features regularly. Just check for the fresh version in WordPress admin panel. We are open to your ideas. If you require some additional features, which could as well improve our plugins, just share it with us. We will consider adding them in our future updates. We don’t provide installation services for our plugins. However, we’re happy to provide you with set up tutorials. And if any errors come up during setting up, feel free to contact us. If you still want installation to be done by a professional, we can recommend to use service of Envato Studio. We don’t supply widget customization services. 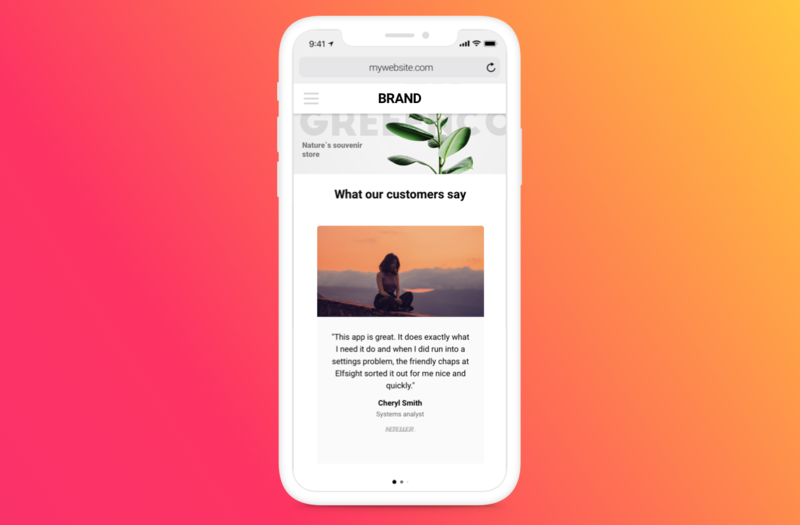 If you would like to modify the way some features operate, express your ideas, and we will consider them for future updates. We do not fix bugs or resolve issues of other plugins and themes, created by third party developers. Also we don’t supply integration services for third party widgets and themes. Feel free to start a ticket in our Support Center at https://elfsight.ticksy.com/ and leave your feedback. 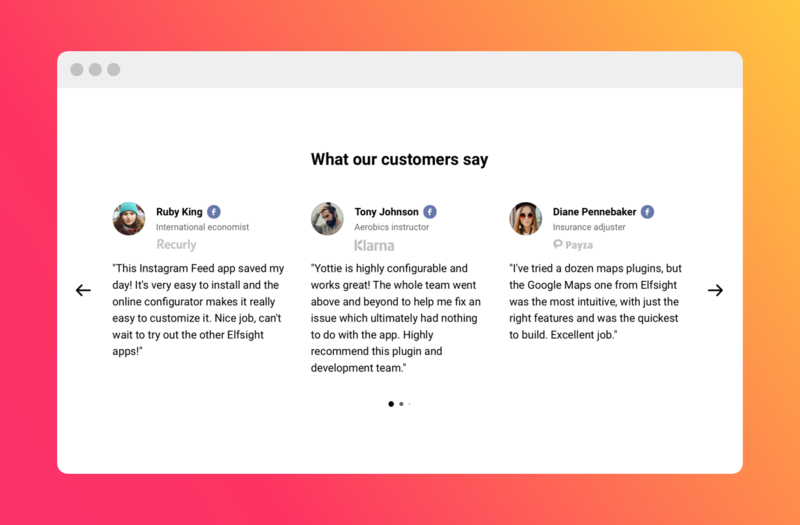 If there’s something you wish to see in our Testimonials plugin, we’ll be glad to hear your suggestions. The most frequently requested changes will be introduced in future updates to help our clients achieve their goals and make them feel satisfied. 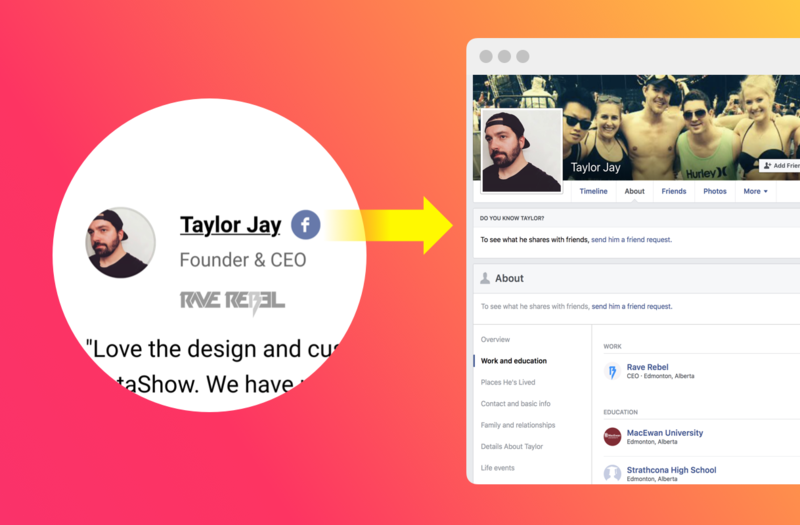 Still haven’t checked our plugin live? 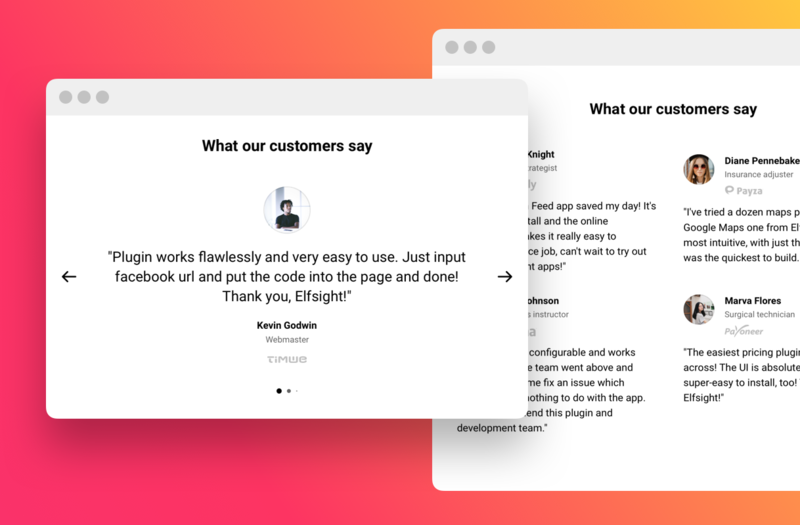 Do it right now on WordPress Testimonials Slider plugin page!